Published: April 26, 2018 at 08:54 p.m. Updated: May 22, 2018 at 06:58 p.m. Controversial tweets discovered a day before the 2018 NFL Draft didn't affect Wyoming quarterback Josh Allen's draft stock, after all. The Bills entered the draft needing a franchise quarterback, and made a trade from the 12th overall pick to the Buccaneers' seventh-overall pick to secure Allen. On NFL Network before the draft, the Allen took responsibility for the social media posts, which contained racial slurs and offensive language. While the Bills have quarterbacks AJ McCarron and Nathan Peterman on the roster, the future is clearly Allen. The 6-foot-5, 237-pound Allen comes equipped with a big arm and mobility, which should serve him well in a cold-weather city such as Buffalo. A two-year starter to close out his collegiate career at Wyoming, Allen completed 361 of 643 attempts for 5,051 yards and 44 touchdowns with 21 interceptions during that span. He also flashed dual-threat capabilities, rushing for 767 yards and 12 touchdowns on 237 attempts on his career. The presence of McCarron, who signed a two-year deal during free agency, should allow the Bills an opportunity to bring Allen along slowly if the team elects to go that route. The Bills paid a price to get their quarterback, as the trade package included Buffalo's two second-round picks (53rd and 56th overall, respectively). Buffalo, however, has been in desperate need of a franchise quarterback dating back to the days of Jim Kelly. The Bills have drafted seven quarterbacks since Kelly retired after the 1996 season, and none of them have posted a winning record, according to NFL Research. The Bills also traded up again later in the first round from No. 22 to No. 16 to select Virginia Tech linebacker Tremaine Edmunds. 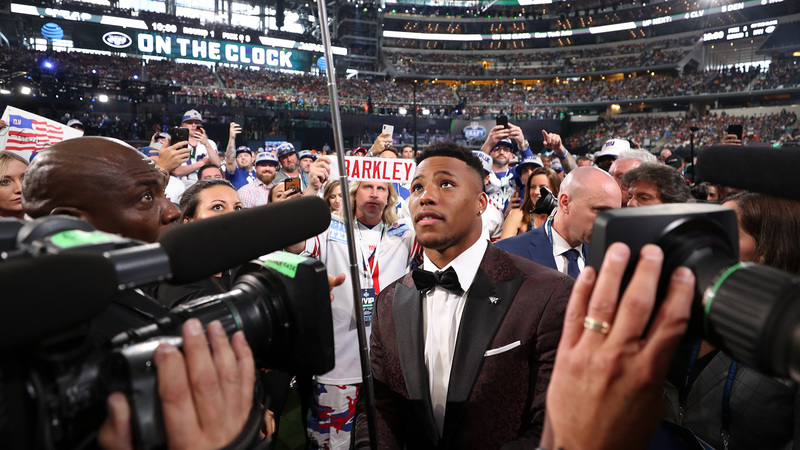 The 19-year-old turns 20 on May 2 but first has his selection to celebrate, and brings what Mike Mayock called "rare size and skill set" that will make him incredibly versatile. Edmunds has been projected to be the modern linebacker, a defender athletic enough to play in sub-packages and match up with today's freakishly athletic tight ends. He'll get exactly that match-up twice a season when his Bills face Rob Gronkowski's New England Patriots.